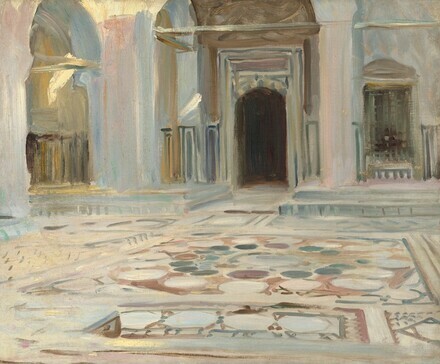 One of a group of oil sketches associated with John Singer Sargent’s travels to Egypt in 1891, this painting represents the Mosque of Sulayman Pasha al-Khadim in Cairo’s citadel complex. Built in 1528, it is considered the first Ottoman-style mosque in Egypt. Using quick brushstrokes and an array of muted colors, Sargent captures the interior courtyard at a tranquil moment. A wooden door on the far wall leads to the mosque’s prayer hall; marble wall panels are visible on either side of the doorway together with a grilled window. Sargent chose a low vantage point to highlight the intricate stonework of the inlaid marble floor. The Gallery’s collection includes other works from the artist’s extensive travels abroad, including Street in Venice (1882) and Valdemosa, Majorca: Thistles and Herbage on a Hillside (1908). The artist's sister, Mrs. Francis Ormond [1870-1955, née Violet Sargent], London; gift to Sir Alec Martin [1884-1971], London, after 1926; sold 1966 through (Sutch and Martin, London) to Joseph F. McCrindle [1923-2008], New York; gift 2006 to NGA. Provenance information was kindly supplied by Richard Ormond in a letter of 17 December 2004 and an e-mail of 6 October 2006, both to Franklin Kelly, in NGA curatorial files. The painting was given to Martin, along with other Sargent works, by Mrs. Ormond and her sister, Emily Sargent (who jointly handled their brother's estate), to thank him for masterminding the 1925 Sargent sale at Christie's. Martin was an employee and later chairman of the auction house. Martin's son, W.A. Martin, owned the gallery Sutch and Martin, and the younger Martin wrote to McCrindle that the painting had passed from the artist's sister "into the possession of my family and I sold it on behalf of my brother" (letter, 7 November 1966). A 1978 invoice for conservation work on the painting refers to it by the title The Road to Jerusalem. Copies of the letter and the invoice are in NGA curatorial files. Exhibition of Works by the Late John S. Sargent, R.A. Winter Exhibition, Royal Academy of Arts, London, 1926, no. 310, as Pavement, Jerusalem. Opening Exhibition of the Sargent Gallery, National Gallery, London (now Tate Britian), 1926, unnumbered catalogue, as Pavement, Jerusalem. Charteris, Evan. John Sargent. New York: Scribner's, 1927, p. 288, as Pavement, Jerusalem. Mount, Charles Merrill. John Singer Sargent: A Biography. Rev. ed. (originally published 1955). New York, 1969: 448, as Pavement, Jerusalem. Ormond, Richard, and Elaine Kilmurray. John Singer Sargent: Figures and Landscapes, 1883-1899. The Complete Paintings, Volume V. New Haven and London, 2010: no. 936, repro. Grasselli, Margaret M., and Arthur K. Wheelock, Jr., eds. The McCrindle Gift: A Distinguished Collection of Drawings and Watercolors. Exh. cat. National Gallery of Art. Washington, 2012: 3, 19, 20 fig. 9, repro. 185.